I've been fighting this awful headache/earache/face pain for 2 weeks now. It seems to linger in the background all day then, just after dinner, BAM, it hits me with it's best shot and usually takes me out. This means instead of blogging, I've been lying in bed hiding in the dark. I finally caved and went to the doc and was sent home with no real diagnosis but a bag full of meds so I'm hoping to be back at it this week. Last week I shared a recipe for Southwest Lettuce Wraps that left you with half a can of black beans and half a can of corn so I recommended making chicken salsa. 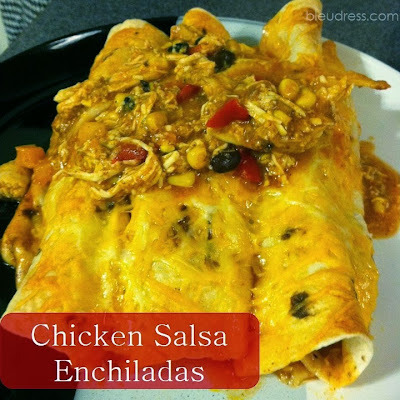 I snacked on the salsa for a few days then turned it into a super yummy "enchilada" recipe. I know zilcho about Mexican food so there is a good possibility there is absolutely nothing authentic about this "enchilada" recipe but it was delicious and that's all that really matters, right? Mix together the salsa, 1/2 cup Mexican cheese and the sour cream. Fill the tortillas with equal amounts of the filling and roll. Pour a thin layer of the sauce into the bottom of a baking dish (an 8x8 fit my 6 large tortillas nicely) and add the rolls. Pour more of the sauce on top, I only used about half of the can all together. Bake at 350 for 25 minutes then add the extra cheese on top and bake for another 5 minutes. Thanks for sharing! My family would love this! !